Just as Americans prepared to gorge on their Thanksgiving meals last week, the Centers for Disease Control and Prevention blasted out an ominous warning: Throw out and definitely do not eat any romaine lettuce, since it might contain potentially deadly E. coli bacteria. But this Monday, following further investigation, the CDC downgraded its warning. Romaine lettuce should be safe to sell and eat, unless it originally came from central or northern California. Unfortunately, most romaine lettuce is not clearly labeled with its source—so unless you can confirm where it was grown, you should still avoid it. 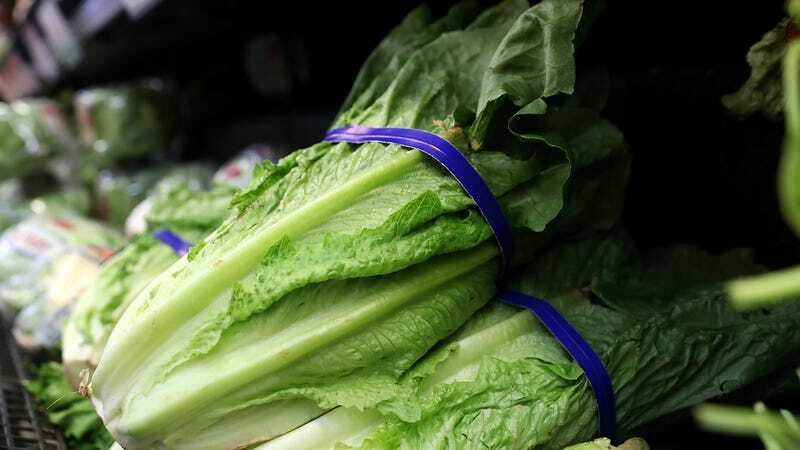 According to the CDC, at least 43 people in 12 states have been sickened so far with the same outbreak strain of E. coli tied to lettuce, with 11 cases having been reported since last week. Canada has had to deal with the outbreak too, with at least 22 confirmed cases as of November 23. In the U.S., 16 people have been hospitalized as a result, and one person developed kidney failure. Fortunately, as of yet, no one in either country has died from their infection. The CDC, in conjunction with the Public Health Agency of Canada, has determined that the most likely source of the outbreak is romaine lettuce harvested from Central Coastal growing regions of northern and central California. But no common grower, supplier, or brand of tainted lettuce has been spotted so far, according to the agency. The type of E. coli behind the outbreak is known as Shiga toxin-producing E. coli O157:H7. This particular germ tends to be nastier than other strains of disease-causing E. coli, thanks largely to the Shiga toxin. It can cause severe, bloody diarrhea, stomach cramps, and a slight fever, though some infected people experience no symptoms. Most sick people do recover without treatment within five to seven days, but about 5 to 10 percent can develop a specific type of kidney failure known as hemolytic uremic syndrome. The strain of O157:H7 identified in the current outbreak bears a close resemblance to the strain behind a 2017 outbreak caused by tainted leafy greens in the U.S. and by romaine lettuce in Canada. But it isn’t related to the outbreak of O157:H7 traced to romaine lettuce that happened earlier this spring. That outbreak caused more than 200 illnesses and at least five deaths, and was likely spread by a tainted water source close to farming regions in Yuma, Arizona. Though the CDC has narrowed down where this tainted lettuce is coming from, it’ll still take some time for the danger to pass. The tainted lettuce came from summer harvests of the vegetable; for the upcoming winter harvest, major growers have agreed to place labels on their stock so customers, retailers, and public health officials can clearly identify where it was grown and harvested. But for now, many people will still be in the dark about their lettuce’s origins. Anyone who doesn’t know where their lettuce is from, the CDC continues to warn, should still just throw it out.